If you are working on Calbug transcriptions, you’ve probably seen some dragonflies and damselflies pop up. So, I wanted to take the opportunity to let you know how I’m using data from these specimens in my Ph.D. research. But first, why study dragonflies? First of all, these charismatic aquatic insects have been well-collected over time, making them good subjects for studies of change in community composition and distribution. 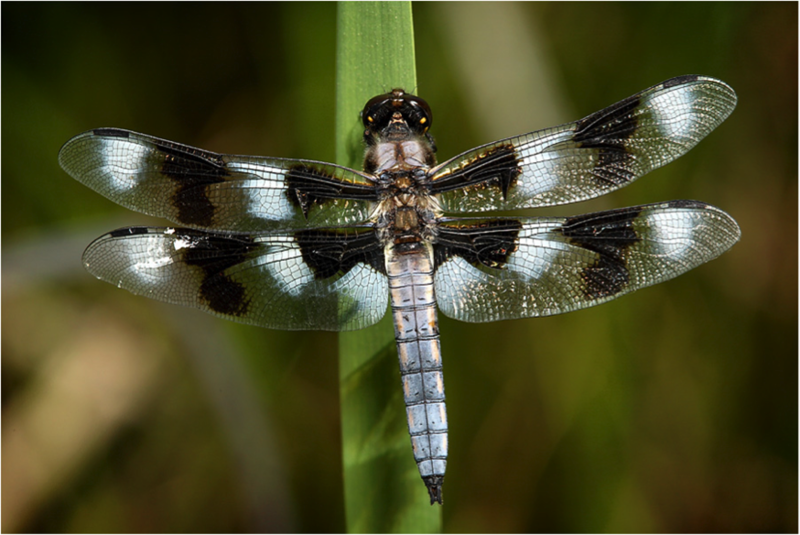 Dragonflies also have a range of known pollution tolerance-levels and are useful indicators of general habitat degradation for freshwater habitats. They may be particularly good indicators of biological effects of climate warming. Studies in Great Britain have shown that the ranges of many species have expanded, range boundaries have shifted northward, and first-flight days are occurring earlier as a result of climate warming since 1960. Many of these changes are occurring faster or are more pronounced than in other groups. For example, one study found that dragonflies in Britain have experienced range shifts averaging 88 kilometers (km) northward, compared to 53 km for butterflies. Overall, dragonflies tend to like warmer habitats, and their high dispersal ability may allow them to respond more quickly to climate warming. At the same time, some species, usually those specialized for stream habitat or certain types of wetlands, are experiencing significant range reductions. California is an interesting place to study changes in aquatic insect communities, because this relatively dry region has experienced drastic changes in aquatic habitat over the past 100 years. For example, irrigation for agriculture across the previously dry Central Valley has created more permanent freshwater habitats throughout the summer. The state has also experienced a dam-building frenzy over the past 100 years… 1400 dams now block the flow of every major river and most minor ones across the state. This eliminates significant portions of flowing water habitats and increases the amount of lake-type habitat. The human population of California has also dramatically increased from around 2.7 million to 37 million people over the past century. So, water demand is high and landscapes are becoming more and more dominated by urban areas and agriculture. So, how are these changes influencing plants and animals? My research addresses this question by focusing on dragonflies and damselflies, collectively known as Odonata or “odonates.” In one study, I’m using the locality and date information for each specimen in our collections to compile species lists for different California counties and time periods. The goal is to identify changes in odonate communities—such as species richness and the percentage of habitat specialists versus generalists—from the species lists, and identify species that are expanding or contracting in distribution. Museum collections, however, have some problems with their data, as you probably are beginning to realize after participating in the data entry! One is that collecting effort varies for different regions and time periods based on the interest of collectors. We can try to correct for this using a combination of statistics and smart data selection. For example, some researchers have used a relatively new statistical method that incorporates the length of species lists for sites or regions as a measure of effort for that area. This assumes that regions with longer lists had higher effort (an assumption that often, but not always, holds true). In regions with short lists, you would expect to find more species than were actually present in the records. In particular, some species that are harder to find or are less common may occur in more regions than what is represented in the collection. After accounting for effort, the ultimate goal is to determine whether changes in landscape variables, such as temperature, precipitation and human population influence communities across regions. I have also resurveyed sites originally sampled by C.H. Kennedy (a collector you may come across!) in 1914. While he left comprehensive lists of species collected at specific sites throughout California and Nevada, he did not indicate the dates that he visited each site in his notes! So, I used information from the specimens to reconstruct specific dates that Kennedy sampled each site, and then visited the sites within a week or so of the original sample date. In preliminary work comparing his surveys to my own, I have found that communities are becoming more similar across sites—we are seeing a homogenization of dragonfly communities, which may reflect the spread of urban and agricultural landscapes. Hopefully, this gives you a taste for how we might use some of this data. We will keep you posted on the results! And, feel free to email me, at jball@berkeley.edu , for more information on this research. Interesting, daunting, and simultaneously depressing. I have just started to get dragonflies and have loved to see them! They are so beautiful and delicate. One in particular was collected in 1914 and was gorgeous! I never realized the many differences in markings of insects before.Thank you for your information on your research, makes me want to keep transcribing.